Russian developer Mikhail Pozhidaev, himself visually impaired, has created a free operating system for the blind, which is simple to use and compatible with all platforms. “A. E. E. Enter. Command. S.U.D.O. Enter..., the ‘voice assistant’ calls out as Mikhail frantically types on the keyboard of his computer. “You see, I’m no slower than a sighted person,” proudly announces the young man. The 32-year-old Mikhail Pozhidaev lost his sight at the age of 17 after suffering a retinal detachment, as he was preparing to enter the first-year computer studies program at the State University of Tomsk in Siberia. “I underwent fourteen surgical procedures, to no avail,” he recalls bitterly. Mikhail decided to take a break in his studies in order to get used to his new condition. He completely reinstalled all software on his computer and searched for IT tools available for the blind, such as Jaws For Windows, which reads the text displayed on the screen and allows the person to navigate in the traditional office environment with the help of a ‘voice assistant’. Returning to the university in 2002, the young aspiring developer soon realized that these readily available solutions were not suited to his needs. “These tools do not permit a person to engage in computer programming work, and are extremely slow – they force one to work in an environment originally designed to be operated by a mouse, which is inconceivable for a visually impaired person,” he explains. 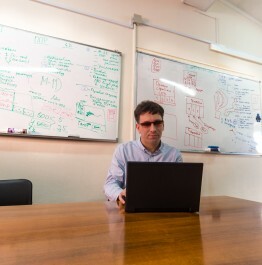 Mikhail therefore switched to using the GNU/Linux operating system, which allowed him to create a customized work environment. Freed from the restraints imposed by windows and other such menus, the young man regained the desirable ‘cruising speed’, completed his studies in 2007, at the same time as his fellow classmates, and has kept in contact with them. In 2010, his peers, impressed by his achievements, suggest the idea to make his program available to all people. This is how Luwrain got its first lines of code back in in 2012. Three years later, the draft made by Mikhail turned into an operating system in its own right. It consists of a no-frills black-background monitor and a main menu offering various categories - news, notepad, audio player, etc. – all accessible with simple tapping on the arrow keys of the keyboard. Navigation through the interface is made possible with an artificial ‘voice assistant’ – in Russian or English. “Luwrain offers people with visual impairments the opportunity to access information and functions quickly and easily, regardless of their computer skills level. The audio presentation quickly, in a matter of minutes, explains how the system works, which is not the case for other interfaces that may seem totally incomprehensible to people born blind and having never seen, for example, a window in their lives,” says the computer scientist. A completely free system – the Luwrain is freely available on the Internet and can be installed either as a primary OS or as an application on Windows, MacOS, or GNU/Linux operating systems. “The goal is that Luwrain remains accessible to as many people as possible, regardless of their financial situation,” insists the young man, who, in particular, proposes installing his system on the Raspberry mini-computer, which sells for around 30 euros. However, Mikhail does not hide the fact that this project may have a commercial aspect as well, if private companies undertake to create compatible software. The Linux license does not allow Luwrain to be sold. On the other hand, we could open an online store that would offer downloadable applications for the blind – a totally virgin market for now,” he admits. If Mikhail allows himself to say “we”, it is because he was hired in February 2015 to work as an IT architect by the Moscow-based Elektronnaya Moskva Certification Centre to develop his project. “We plan to release the final version by the end of this year, but before that can happen, there is still a lot of work to be done,” he says. Before finding this job, the young man had spent three years contacting various Russian government and private organizations, as well as foreign ones, receiving refusal after refusal. “Nobody wanted to believe I was just trying to do something good for people. We hear all the time about innovations, but when someone really has an innovative social project, people treat him like a fool!” he concludes. Nonetheless, the demand is real. Worldwide, some 285 million people are visually impaired – 39 million being fully blind, according to the World Health Organization (WHO). Nearly 90% of these people live in low-income countries. Russia has approximately 103,000 blind people.